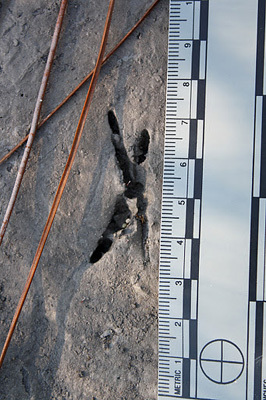 Bird Tracks are an exciting aspect of naturalist studies and can be found in many places. With hundreds of species of birds found in North America, studying their tracks can seem very daunting. 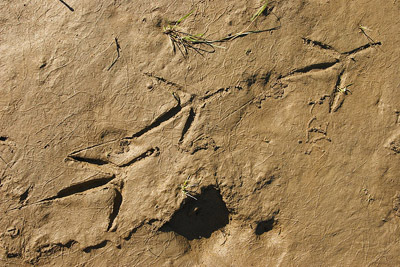 Since tracks are made mostly by the feet of birds, one of the easiest ways to break down different tracks is according to foot type. The main groupings are: anisodactyl, game bird, palmate, totipalmate and zygodactyl. It also helps to know that bird toes are numbered from the back toe (called "toe 1" or the "halix") to the outside. So the outer most toe is called "toe 4." 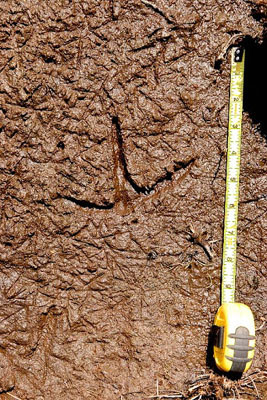 These "classic bird tracks" are made by birds with feet that are anisodactyl, which is defined by a foot in which 3 toes are pointed forward and 1 is pointed backward. Birds that have feet designed in this way include practically all songbirds, herons and egrets, eagles, hawks, falcons, vultures, doves, and moorhens. Kingfishers are often included in this group because they leave tracks that match this group, even though they have toes 3 and 2 on their foot fused for part of their length (syndactyl). 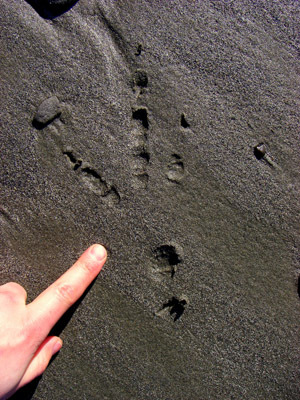 An example of anisodactyl tracks are visible in the photo below, in this case from a great blue heron (Ardea herodias). 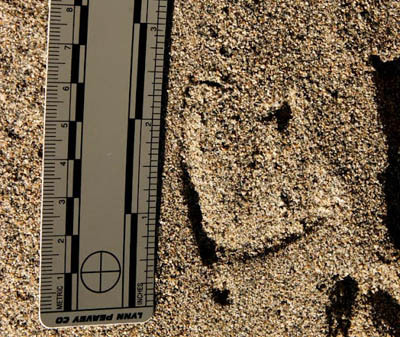 This type of foot structure, sometimes called “incumbent,” leave what is commonly called “game bird track” pattern. In this grouping, the toe 1 (also called the halix) is greatly reduced or even absent. This category also includes birds that have only reduced webbing (semipalmate). Birds which leave game bird type tracks include: quail, pheasant, grouse, ptarmigan, partridge, turkey, coots, rails, cranes, plovers and sandpipers. Coots have especially odd feet, in that each toe has wide, flattened lobes that act like webbing. 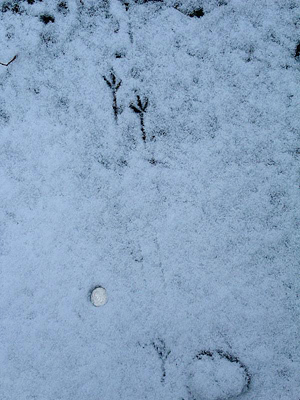 The 2 examples below are the track of a sandhill crane (Grus canadensis), and the tracks of a ruffed grouse (Bonasa umbellus) in the snow. This kinds of tracks are left by birds with feet that have full webbing between 3 of their toes and have a halix that points backwards and is free of webbing. These are structured essentially the same as the game bird tracks, with the exception of having full webbing. Though differentiated for the sake of tracking, palmate and game bird tracks are scientifically considered to have anisodactyl foot structure. The webbed track below is from a green-winged teal (Anas crecca). These are also webbed tracks, but in this case, have webbing between all 4 toes. Birds that leave this kind of track have toe 4 as the longest toe. This kind of foot belongs to a limited number of birds, including: pelicans, boobies, gannets and cormorants. These tracks are made by birds which have 2 toes forward and 2 toes pointing backward on their feet. Birds that leave these kinds of tracks include: parrots, woodpeckers, cuckoos, owls and osprey. Both owls and osprey can rotate toe 1 significantly, and so there can be a lot of variability in the way the tracks appear. Below are 2 examples of zygodactyl tracks, the first is the right track of a northern flicker (Colaptes auratus), and below it are the tracks of a burrowing owl (Speotyto cunicularia). Birds tend to move in one of several ways when on the ground, either walking, running, hopping or skipping. Walking is the favorite mode of locomotion for many birds that spend lots of time on the ground. Below is an example of a walking trail left by a ruffed grouse (Bonasa umbellus). Running is another mode of locomotion used by birds that spend lots of time on the ground. It is differentiated from a walk by the distance between each track being several times that of a walk. In the photo below a set of quail tracks run across a sand dune and end where the bird pooped and took off into the air. 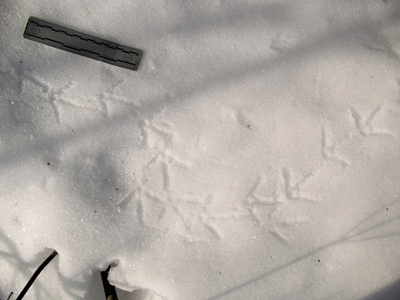 Hopping is done by some birds, and is defined by the tracks landing right next to each other. Pine siskins, gold finches and dark-eyed juncos are examples of birds that frequently hop when on the ground. In skipping, the bird moves in a similar fashion but the tracks land slightly off set, so that one tracks leads ahead of the other one in the pair. Skipping is used more often by small perching birds that spend a lot of time on the ground. Crows, ravens, a variety of sparrows all commonly skip. The example below is the skipping trail of a varied thrush (Ixoreus naevius) in the snow. 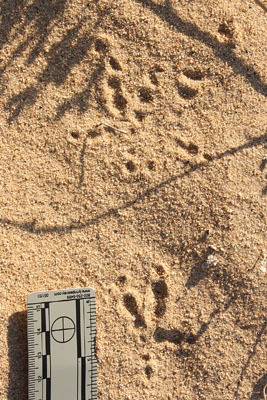 Where you find tracks can really help you shorten the list of possible species they may belong to. It really helps to study the natural history of the birds in your area, and know their preferred range and habitats. Water loving birds such as ducks and herons are not likely to be found in an arid landscape, far from water. Nor are open country birds such as the western meadowlark and burrowing owl going to be found in the middle of a coniferous forest. 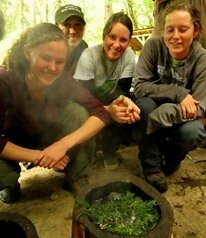 Each species has its own particular niches and food preferences, and learning more about them will help you improve your tracking skills. 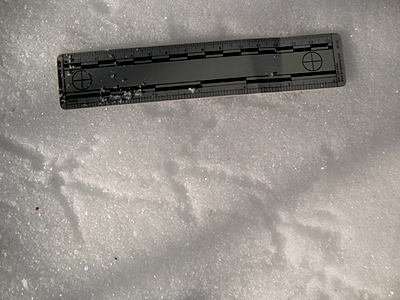 Utilize measurements when studying bird tracks, and you will help narrow down the possibilities even further. Measure the length and width of each track, and also note the lengths of the toes. Measure the distance between each track in a walk or a run, and measure the distance between groups of tracks in a hop or a skip. Also, remember to take notes on where you found the tracks (country, state/province, city, park/neighborhood), what kind of birds you may have seen in the area, what sort of habitats are present, what substrate the tracks were found in, date/time and weather conditions. Record your observations, so you can reference them with a field guide. If you really want to improve your tracking skills, you must follow the practice of any good naturalist: take lots of notes! Also, make sketches of your observations or take photographs, so that you can look at them again and again in the future. Often times, you will learn more about a set of tracks over the span of not just days, but months and years. The tracks themselves can always teach you more, and each time you come back to them you may see them slightly differently.